Due to parts damaged in the mail, I'm having to radically change this build, although I'm sticking with my electronics choice. The body is a "premium" body from Guitar Fetish, my first purchase from them. 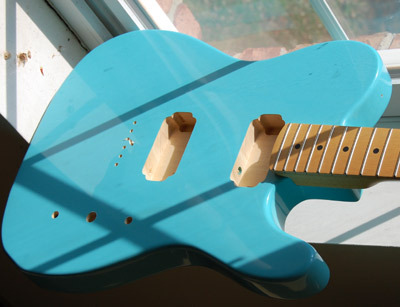 Daphne blue is a traditional color and I'm going to try to age it down, although I doubt the poly finish will let me. Under that finish is poplar wood, which isn't nearly as common as alder or ash, but it is a very credible wood and comparable to alder. It is also ugly, but that is why we put a solid finish on it. If it won't age, I will sand a bit and coat it with nitrocellulose and then age it, which will either work or create an incredible mess. I'm going to use a Chinese neck I ordered just to test their quality. It isn't one piece, it is maple over maple with 22 frets. It needs some work on the fret ends, nut and truss rod, but is actually a very good looking neck with a very thin urethane finish that should allow me to age through just fine. I may shoot some nitro on it as well. Pickups are taken from the Gretsch Tim Armstrong signature model, a brand new pair of Blacktop Filtertron G5400, which should give this guitar some serious jangle considering the wood selections. I'm already a fan of Fender Cabronita guitars (I own two, have owned two others) but this should take that to the next level, tone wise. This might seem like an unusual choice of pickups, particularly since I have a drawer full of Fender pickups, but they doesn't make a lot of humbucker sets, I didn't want to use a pickguard, and already have a Fidelitron Cabronita so wanted something similar but different. These Gretsch pickups sound very sweet, they are very affordable (I found a deal for $65 and free ship), and I think the wood choice will accentuate that tone. I have to admit, the look of these pickups also attracts me. It isn't a deciding factor by any means, but I do appreciate the transmundane and you seldom see Gretsch pickups with the plastic bezels on a Telecaster. I think it will add to the funky vibe. 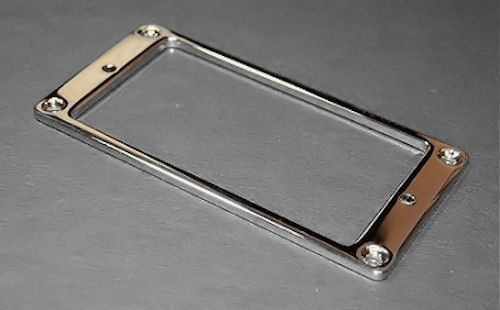 I'm also going with a new vintage "FENDER" stamped bridge, with the wider spacings. It's a good bridge, old school, and I have several of them. For the lacquer (nitrocellulose) finish, I'm going the easy way and spraying it on. Granted, it probably isn't the best way, but it is how most casual users would do it. The goal is to see how UV affects it, not to show off my wood finishing skills, which I admit I have few. I picked up two cans of this using Amazon Prime for a little bit of nothing. Hopefully, my frugal nature won't come back to bite me. Aging the neck... Since we are waiting for parts to show up, we start by aging the neck, using the low power rig since it is empty and the perfect size. It is slower, but after just three days of exposure, you can see that the $34 guitar neck looks like something much more expensive. I'm still debating putting a coat of nitro on the neck as well, so I can age check the finish a bit, but want to get a dark tone on it first. You can also see the body at the bottom of the one neck, it came in just a few hours ago. The neck fits it like a glove. My first impression of this GXP Guitar Fetish body is pretty high. It was wrapped very well, clearly marked country of origin (China) and the cuts are nice and clean. The finish isn't perfect, but we are going to coat it with some nitrocellulose anyway. Getting the Gretsch pickups in there is going to be tricky. The holes are perfect for it, but they want to setup much higher than they would in a flattop Telecaster, so I might have to buy some longer screws to get them to drop down lower. This isn't a flaw, just a part of matching up parts that aren't made for each other. Update - Started putting the nitrocellulose over the urethane, and there was NO curling up of the finish. That is a problem with some finishes, but I had it on good authority that I could maybe get away with it on urethane. This means that coating the necks shouldn't be a problem either, as they always have a urethane finish. I've put 4 thin coats and the goal is to leave it at that. It has now been aging for one day, with no visible change in the finish. This was expected, as I anticipate it will take several days using the low powered rig. Update - Well, you learn something new every day. The Gretsch pickups will not fit in the guitar. The side to side distance is fine, but the height is off. They won't drop down low enough to be under the strings, telling me they aren't made for flat top guitars as is. I could go try and find some longer screws and longer springs, but that seems to be more work than it is worth, as I can just use the pickups for an archtop I have planned in the future. So I needed to get a new set of pickups and do so on a budget. So I turned to Dragonfire Screamers humbucker set. For $40 to my door, it was impossible to beat. 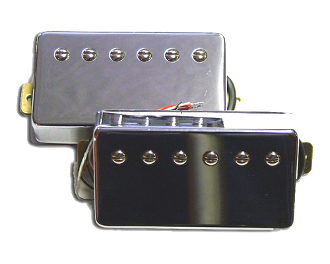 I've bought some P90 pickups from them, and found them to be pretty nice parts, particularly for the price. I already had a pair of low profile chrome steel bezels, so it looks matched up quite well. These are obviously more of a heavy metal pickup, but I don't have anything like that, so why not? It's been a couple of days, not really seeing anything changing in the finish, but it is early still. I've been working on the finish, but it seems the more I do, the worse it becomes. I should have taped off the neck when finishing, as it doesn't fit now. Just didn't think about it. 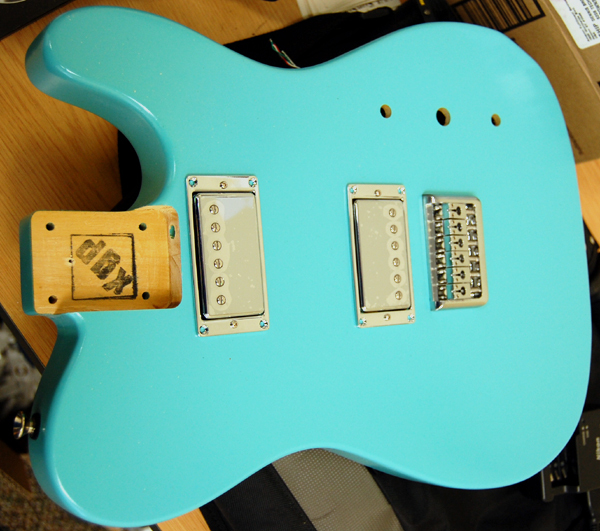 Below is the guitar with the bridge installed and the pickups setting in place. I want to install the neck first, then put on strings, then install pickups so the string align with the pole pieces. I ended up changing to this spare bridge I had, as the Fender bridge had different hole spacing for the strings and this one matched up well. It's a heavy bridge, inexpensive import but still a quality piece. As you can see, this is a lot of chrome, with no plastic showing at all. 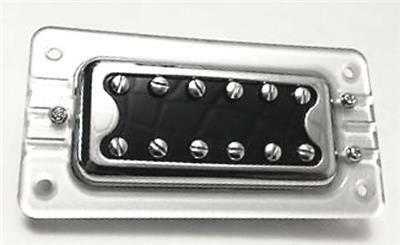 I will use standard Telecaster knobs and a chrome pickup selector as well. I rather like the look. I'm waiting for a pre-assembled wiring hardness to show up, but it might not have the right shafts. I keep forgetting, this isn't through sheet steel, it is through wood, so you need longer shafts. I am no luthier, that is for sure. It's still fun, and I'm still learning a lot. I expect to throw it in the curing rig and leave it for a long time. I'm determined to get this nitro over urethane to work. 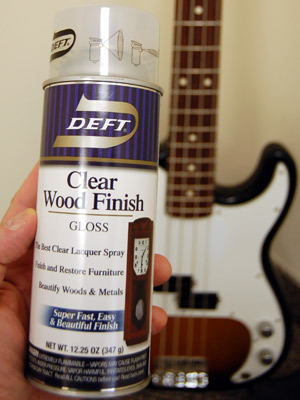 Similar to the results with the Fender Precision bass, the UV really wasn't doing much except oxidizing the finish. It was a bit of a let down, although the guitar was fun to play with (and was given to a friend). In the end, I've learned that nitrocellulose (or any lacquer) should be done over raw wood, with no other sealers, finishes or products at all as an undercoat. The next project will be just that.